The program starts in September year 1 and consists of three years' studies at a minimum of three different partner universities. Out of a total of 180 ECTS points, 60 ECTS consists of courses and research seminars (42 ECTS) and internship (18 ECTS). Most teaching is concentrated during the first year (36 ECTS) to give to the students the right tools and knowledge as soon as possible. During year 1, four weeks' of summer schools are organised by the partner universities. These weeks are focussed on general knowledge and skills and obligatory for all students. The first autumn semester is be spent at one of the consortium's universities, chosen according to the doctoral candidate's academic and occupational background and future plans for the thesis and future career. Semester 1: (30 ECTS): Month 1: Summer school 1 for all (3 ECTS). Design of an individual, provisional study plan. Integration in one or several research seminars and the unit's local PhD program/seminar. Months 2-6: Literature and data review for thesis. Course(s)/research seminars on relevant theories and/or methods (12 ECTS). Identification of mobility universities. Language course(s) (local and/or mobility university languages (6 ECTS). Month 6: Presentation and approval of thesis project proposal (9 ECTS). Designation of supervisors. 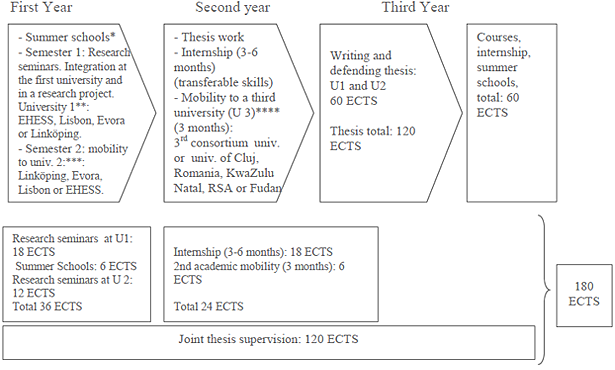 Detailed study plan, including thesis topic, further courses/research seminars supporting thesis work and career plans, best choice of internship, and supervisors (one at the S1 university, one at another partner/mobility university and one for the internship). Semester 2: (30 ECTS): Months 7-12: First mandatory mobility period (3 months) to best individual choice of consortium university (12 ECTS), participation in courses and research seminars supportive of theories, methods and data for thesis. Thesis work, introductory phase (15 ECTS). Month 11: Summer school 2 for all (3 ECTS). Semester 3-4: 2 (60 ECTS) Internship (18 ECTS). Courses/research seminars (6 ECTS). Thesis work (36 ECTS). Second mandatory mobility period (minimum 2 months) to an associate university. Choice of internship and university mobility according to best suited and accessible sites due to the individual neds of the student. Semester 5-6: (60 ECTS): Thesis work, presenting results and article at workshops/conferences (60 ECTS), participation in research seminar(s). Thesis defence.